Bird-cherry oat aphid (top left, ‘wheat and grass’ aphid (top middle), Russian wheat aphid (top right), English grain aphid (bottom left), and greenbug (bottom right). Bottom middle: phenological model of bird cherry-oat aphid aerial abundance driven by degree days and biological feedbacks. Issue: Injury to wheat production systems from insect pests varies with climatic factors and is in flux globally due to expansion of the pests’ geographic ranges within and between continents. Long-term monitoring of pest complexes can detect these trends and inform timely responses. Action taken: We conducted a retrospective examination of a 17-year record of suction trap data from traps located in ID. These data allowed the construction of models that relate aphid flights to climatic factors over the 17-year period. The models will help to determine potential responses of aphids to future climatic trends. Results: Three aphid species were most abundant in these suction trap records: Rhopalosiphum padi (bird cherry-oat aphid), Metopolophium dirhodum (rose grass aphid), and Diuraphis noxia (Russian wheat aphid). Over the 17-year record, each of these species responded differently to climate variability. Russian wheat aphid abundances were negatively correlated with increasing temperatures, while rose grass aphid abundances were positively correlated with increasing cumulative precipitation. In contrast, bird cherry-oat aphid was not responsive to the climate variables measured. All three aphid species showed large-scale interannual fluctuations, showing that they are regulated by biological feedbacks that have yet to be determined. Thus, the contributions of density dependence (feedbacks) and climate to aphid population dynamics are species specific in spite of all three using wheat as a principal host. This outcome is consistent with other evidence that insect species respond differently to climate trends. The long-term trends in changes in abundance were relatively small compared to interannual cycling, so the implications for pest management do not seem to be great. The record does not include sequences of years as warm as anticipated in the region, so projections should be made with caution. Davis, T. S., J. Abatzoglou, N. A. Bosque-Pérez, S. E. Halbert, K. Pike, and S. D. Eigenbrode. 2014. Differing contributions of density dependence and climate to the population dynamics of three eruptive herbivores. Ecological Entomology 39: 566–577. Merickel, J. W., B. Shafii, S. D. Eigenbrode, C. J. Williams, and W. J. Price. 2015. Modeling the occurrence of four cereal crop aphid species in Idaho. In: Reyes, P. E. (ed). Applied Statistics in Agriculture, Kansas State University, Manhattan, Kansas, pp. 1–38. Above: A late instar Cereal leaf beetle larva with the injury it causes to wheat. Issue: Injury to wheat production systems from insect pests varies with climatic factors and is in flux globally due to expansion of the pests’ geographic ranges within and between continents. Projected changes in climate potentially influence pressure from certain pests. Action taken: We used climate models to project changes in the suitability of Pacific Northwest climates for cereal leaf beetle (Oulema melanopus) under projected climate change to midcentury. The models also accounted for changes in impacts of Terastichus julis, a key parasitoid that currently suppresses beetle populations in the region. A process-based model of feeding by cereal leaf beetle as determined in laboratory experiments, coupled with the projected effects of changing climate on the growth of the wheat crop, was constructed to complement these projections. Results: Warming trends will advance the phenology of cereal leaf beetle and increase the suitability of much of the region for its establishment and growth. The effects are not uniform across the region, with some parts of the range experiencing little or no change in suitability for the beetle (for example, much of Montana), while areas in the Columbia Basin consistently become better habitats for this pest. In addition, data from a long-term study in Utah indicate that parasitism of cereal leaf beetle by its key natural enemy, T. julis, can be strongly suppressed by warm spring temperatures such as those projected to prevail over the region in the future. Together, these trends suggest that cereal leaf beetle could become a more problematic pest in the region than it is currently. Finally, the process-based modeling indicates that changes in injury by the beetle will not be uniform across the region because differences in crop phenology and the beetle can influence its effect on the crop. These results suggest that increased injury by the beetle is more likely to occur in parts of the region with higher rainfall. All of the models are based on certain assumptions and have limitations if those assumptions are not met, but the results suggest future vigilance regarding this pest. Refereed publications currenty in preparation. Metopolophium festucae cerealium, the “wheat grass” aphid. Adults and nymphs are feeding on wheat. Photo by Brad Stokes. Issue: Injuries to wheat crops from insect pests vary with climatic factors and are in flux globally due to expansion of the pests’ geographic ranges within and between continents. Longterm monitoring of pest complexes can detect these trends and inform timely responses. Action taken: We conducted four annual surveys of the aphid fauna at more than 40 sites across the climatic zones of the inland Pacific Northwest (PNW). We also established a colony of a new aphid and tested it in the laboratory for its effects on wheat and its interactions with other aphids affecting cereal crops in the PNW. Results: Throughout the four years of the survey, we detected large populations of Metopolophium festucae cerealium, an aphid species introduced from Europe and not previously reported to infest cereal crops in North America. In many locations, this species was the most abundant aphid detected. We documented the geospatial patterns of its occurrence and interpreted them in light of climatic drivers. In the greenhouse, the aphid is more injurious per capita than most other aphids present in the region. 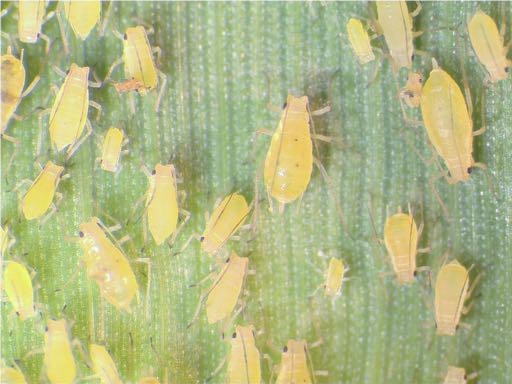 While there is major concern that the new aphid may be a vector for Barley yellow dwarf virus (BYDV), a significant wheat pathogen worldwide, careful bioassays failed to detect BYDV transmission by the aphid, so it appears it is a problem only through it is direct feeding, which is much more manageable. Ongoing work is measuring the impacts of the aphid under field conditions to generate treatment guidelines for producers and studying the basis of its injury to the crop. an invasive and a naturalized aphid species on wheat. Environmental Entomology. Submitted. Davis, T. S., Y. Wu, and S. D. Eigenbrode. 2014. Host settling behavior, reproductive performance, and effects on plant growthof an exotic cereal aphid, Metopolophium festucae subsp. cerealium (Hemiptera: Aphididae). Journal of Economic Entomology 43: 682–688. Foote, N. 2016. Effects of host plant water limitation on insect pestsof wheat in the Pacific Northwest. M.S. Thesis, University of Idaho. Halbert, S. E., Y. Wu, and S. D. Eigenbrode. 2013. Metopolophium festucae cerealium (Hemiptera: Aphididae), a new addition to the aphid fauna of North America. Insecta Mundi 0301: 1–6. Sadeghi, S. E., J. Bjur, L. Ingwell, L. Unger, N. A. Bosque-Pérez, and S. D. Eigenbrode. 2016. Interactions between Metopolophium festucae cerealium (Hemiptera: Aphididae) and Barley yellow dwarf virus (BYDV-PAV). Journal of Insect Science 16: 1–6. Issue: Wireworms are among the most damaging insect pests of cereal crops, and the population dynamics of wireworms may be strongly affected by climate. However, no extensive research detailing links between wireworms and climate had been conducted in the inland Pacific Northwest (PNW); this has inhibited management of these pests. Action taken: We conducted three years of experiments to determine how climatic factors affect the population dynamics and management of different wireworm species. Results: In the dryland region of the inland PNW, two species of wireworms are dominant, the sugarbeet wireworm, Limonius californicus, and the western field wireworm, Limonius infuscatus. Although these two species can have different impacts on cereal crop production, growers have managed them as a single complex. Our research shows, however, that the sugarbeet wireworm is tolerant of a much broader array of environmental conditions than the western field wireworm. The western field wireworm has a relatively short period of activity early in the season as soil temperatures rise, but its feeding activity declines rapidly after April when high soil temperatures become limiting. Our research also shows that prophylactic treatments of seed-applied neonicotinoid pesticides are the most effective strategy for managing this species; the treatments are highly effective soon after planting. In contrast, the sugarbeet wireworm continues to feed throughout the summer regardless of soil temperatures, and it is not effectively managed by seed-applied insecticides. Our research suggests that crop rotations may be more effective for control of this species. Our results show that understanding how climate affects different wireworm species can be used to design more targeted Integrated Pest Management (IPM) programs. Ongoing research is exploring novel control tactics for wireworms, such as biological control, that will reduce the use of prophylactic insecticide treatments. Esser A. D., I. Milosavljevic, and D. W. Crowder. 2015. 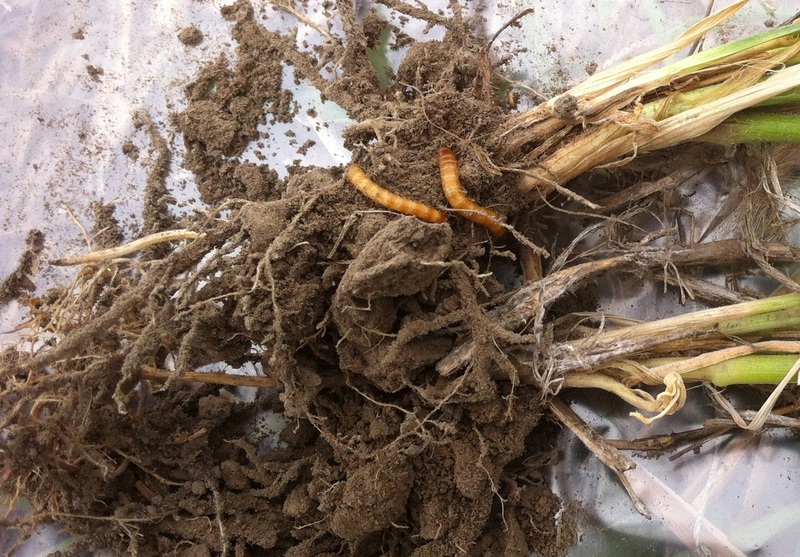 Effects of neonicotinoids and crop rotation for managing wireworms in wheat crops. Journal of Economic Entomology 108: 1786–1794. Milosavljevic I., A. D. Esser, and D. W. Crowder. 2016. Effects of environmental and agronomic factors on soil-dwelling pest communities in cereal crops. Agriculture, Ecosystems and Environment 225: 192–198. Milosavljevic I., A. D. Esser, and D. W. Crowder. 2016 Seasonal population dynamics of wireworms in wheat crops in the Pacific Northwestern United States. Journal of Pest Science. DOI: 10.1007/s10340-016-0750-y. Issue: The REACCH project produced research on agricultural science and management. Such research advances are often inaccessible to decision makers, which creates a barrier between scientific knowledge and decision-making. Action taken: We developed a set of crop and pest management web tools (http://climate.nkn.uidaho.edu/REACCH /decisionTools.php) that utilize REACCH research and climate datasets to help inform grower decisions. For example, we developed a web-based interface for examining thermal suitability for crop selection under both current and future climates over the contiguous US. We developed tools to monitor crop phenology and associated implications for pest and weed management. We also created a set of webpages that provide information on identification and life cycles of pests and weeds, including economic threshold calculators for pesticide spraying and seed treatment. Results: The decision support tools are currently accessible through Decision Support Tools at the REACCH website. We conducted a series of focus groups with stakeholders to improve content and accessibilty of our tools. The focus groups validated interest in our tools among producers. These tools are also being integrated into another set of web tools called the Northwest Climate Toolbox (http://climatetoolbox.org).